Tile Floors – Do you have hard-to-clean bathroom tile floors? Are you so tired of cleaning bathroom tile floors over and over again that you’re thinking about replacing the floor tile? Are the grout lines completely stained? Think about having your tile floor professionally refinished. Refinishing is a process of applying a new, hi-tech coating over the top of the existing tile. It will not only give your floors a new look, but with a hard acrylic coating applied it will also make your refinished floors easy to clean. Miracle Method can repair any cracks or chips, float in new grout, and refinish tile floors in your choice of colors, or even use our Natural Accents stone finish. The Natural Accents stone finish will give your tile floor the look of expensive granite or marble at a fraction of the cost of real stone. You’ll be able to use your new tile floor 24 to 36 hours after the refinishing is completed. 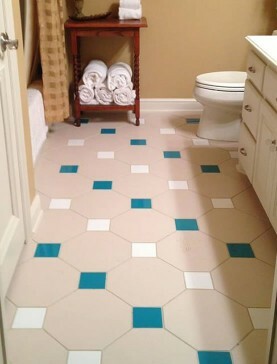 The end result will be a bathroom tile floor makeover that you and your friends will rave about. 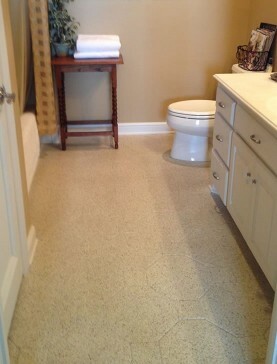 Refinishing these floors gave this bathroom an updated look! Miracle Method refinished these tile floors completely sealing the grout! Tile Floors – What is the process to refinish a bathroom tile floor? Refinishing a bathroom tile floor takes planning and is not just a matter of painting floor tile. The best tile floor refinishers use a two-step cleaning process to remove dirt, detergents, and any body oil. This is a very necessary process to make sure that no contaminants interfere with the adhesion of the new coating. If grout repairs are necessary, the grout is floated with a special quick drying mix to fill in any voids. Once the grout is dry, the tile is wiped down and Miracle Method’s MM-4 bonding agent is applied to ensure adhesion of the new coating. 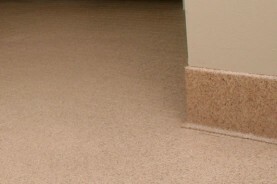 Once refinished with hi-tech acrylic coatings, the end result is a new finish with clean and even grout lines. An advantage to tile floor refinishing is that refinishing completely seals grout, making the floor easy to clean and maintain. Click on Find a Location or call our toll free locator number, 1-888-271-7690, to reach the nearest Miracle Method professional and ask for a free estimate to refinish your tile floors.